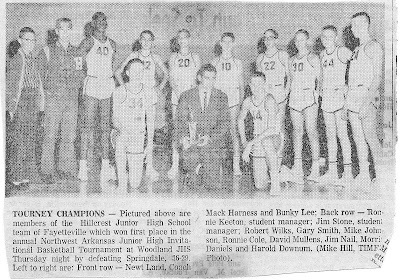 Looking through a large pile of old clippings, I found a picture of the 1960-1961 Hillcrest Junior High (Fayetteville, Arkansas) basketball team, and one face in the picture surprised me. It was David Mullins, son of the man who was at the time president of the University of Arkansas. 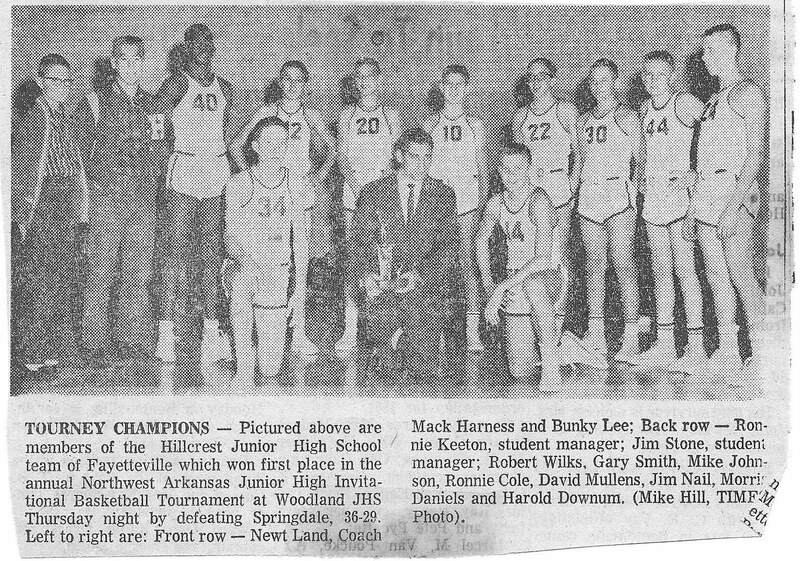 In this picture, David is in the back row, fourth from the right, standing between Ronnie Cole and Jim Nail. The picture was taken after the Hillcrest team had won the annual Northwest Arkansas Junior High Invitational Basketball Tournament. I didn't remember that David was on that team, though I recalled that he attended Hillcrest. He was in the class before mine. David spent some time at Fayetteville High School (FHS). We sat next to each other one year in Mrs. Andrews' Latin class. I think -- but am not sure -- that David had attended a private school in the East for some years, but returned to finish up at FHS. Anyway, I recall that he kept me amused with his drollery, and I tried to do the same for him. Mrs. Andrews was a hoot, but the subject matter was, literally -- and I literally mean literally -- dead. David got a Ph.D. from MIT and taught at the Harvard Business School. He was an assistant Secretary of the Treasury during the Bush-the-First years. In about 1986 or 1987, one of my public policy students at Duke University had an internship at the Treasury Department and did some very enjoyable work for him. In 1990, he was appointed to the Federal Reserve Board of Governors. I recall reading somewhere that at Harvard David was famed for writing all of his lecture notes in a spiral, with tiny letters, on a small scrap of paper. Among his former classmates at Hillcrest and FHS, David has distinguished himself by having his very own Wikipedia entry. See: http://en.wikipedia.org/wiki/David_W._Mullins,_Jr. David's career is proof that a good jump shot is not a requirement for success as an economist. Someone sent me this.....one of my 9000 former students.....found it very funny!....only inaccuracy.....I had a great jump shot! Let me know if you are ever in Greenwich, NYC or DC to catch up. Thanks for your note. I will be seeing Robert Wilks in early October and I will ask him to assess your jump shop to make sure that my memory is not faulty. Consulting my vast files of Fayetteville trivia, I will note that your Wikipedia bio inexplicably omits some of your early achievements, including your role as chairman of the Student Council Cleanup Committee at Hillcrest Jr. High in 1960, plus your selection as the "second band" clarinet player in the 1961 Regional Junior High School Band Clinic. In addition, I know you played baseball on the O.K. & Miladys Cleaners team in the 1960 Fayetteville Babe Ruth league, but it will take me some time to figure your batting average. For a small bribe, I will agree not to post on-line your 9th grade picture in the Hillcrest Jr. High "yearbook." Life in the Pacific Northwest is great. Hope all is well with you.